Records were shattered when the sequel to Pirates of the Caribbean: The Curse of the Black Pearl was released into theaters. Dead Man's Chest was the largest domestic opener of all-time, and also became one of only three movies in box office history to earn over a billion dollars worldwide. 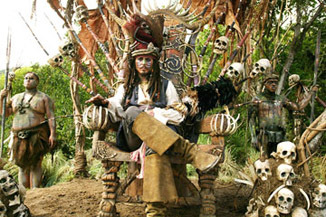 If you own a DVD player, chances are great that you have watched the second movie in the Pirates of the Caribbean franchise...but how well do you know it?